“Texas in Paris” runs through March 1, 2015 at the York Theater Company, 1619 Lexington Avenue (corner of 54th Street) in New York City, inside St. Peter’s Church on Lower Level 2. Texan folklorist Alan Govenar became acquainted with Osceola Mays, a singer of spirituals and an oral poet, and cowboy singer John Burrus separately in Dallas in the 1980’s. Neither had ever been paid for singing before, but in 1989, Govenar booked them in Paris at the Maison des Cultures du Monde to present music from the American South. His experience with Mays and Burrus inspired him to write this play which is set in Paris during 1979. In real life, Osceola and John seldom traveled beyond their separate circles in Texas. Theatergoers soon become the audience for an imagined series of Paris performances. 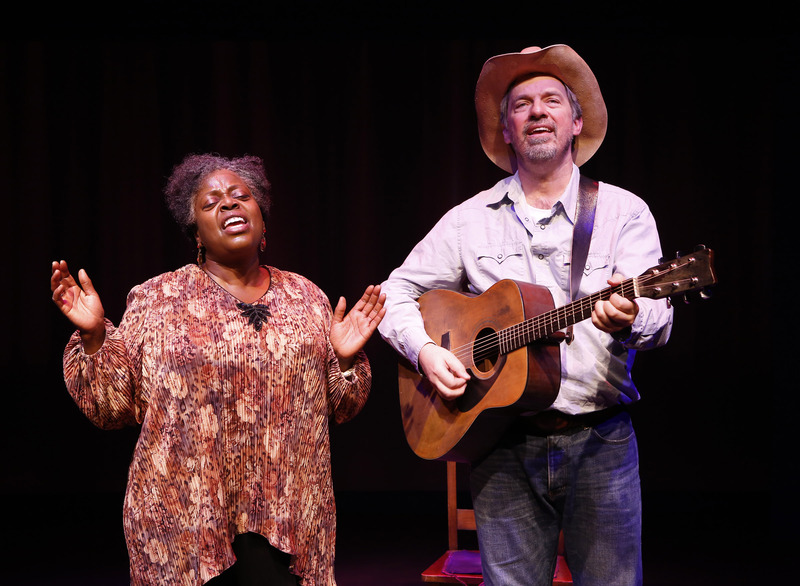 Containing 26 spirituals, cowboy songs and country hymns, this play moves at a comfortable pace for 85 minutes. Texas in Paris stars Tony Award-winner Lillias White as Osceola Mays; Scott Wakefield portrays John Burrus. It is directed by directed by Brooklyn native Akin Babatundé, who attended college with White, and who now calls Dallas his artistic home. White sings spirituals a cappella-style including “Power in the Blood,” “Oh, Freedom” and “When the Saints Go Marchin’ In”, while Wakefield accompanies his country songs with a guitar, harmonica, and banjo. His numbers include “Windy Bill, “Where He Leads Me,” and “When the Work’s All Done this Fall.” For the final song, the pair passionately performs “Will the Circle Be Unbroken” as a duet, a metaphor for the characters’ new bond of friendship. The set design is minimal but effective—two chairs—and a photo montage of Paris with supporting sound effects for the background. One of the photos shows La Rotonde, a café in Paris associated with Ernest Hemingway. White’s interpretation of Osceola Mays is an inspired performance that is effusive and demonstrative. She amply fills the role with soulful energy. She sings, snaps her fingers, slaps her thighs, and easily draws the audience into clapping along. In the beginning both characters have their concerns. Osceola (White) tells John (Wakefield) “I’ve never sat by a white man before” and she’s never been on an airplane. He tells her there’s nothing to worry about. But when the cowboy struggles to recall song lyrics on stage, Osceola is the one doing the reassuring. The set-in-his ways cowboy is homesick. He just wants to remember his lines and return to Texas and his wife. Osceola is a widow who is ready to move on. She grows happier by the day with childlike delight in new experiences and becomes ready to adopt Paris as her new home. The actors both complement and contrast each other. White’s character is as verbose and outgoing as Wakefield’s is quiet and retiring. Thrown together by chance, the performers move from discomfort with the unfamiliar to understanding and acceptance of each other. They transform from strangers to kindred spirits. The actors present inspired performances that capture the unique personalities they portray. A rich and strong voice is required to fill the role of Osceola. White truly brings one to the stage. Wakefield, also a talented singer, plays the perfect partner. Artistic director James Morgan told theatergoers, “The music is fascinating but it’s not a musical. It documents two lives, but it’s not a documentary.” The play entertains and tells a story without lecturing. “This is a story that could only have happened in Paris,” said Govenar. He hopes the play will help continue a conversation about race relations among contemporary Americans. “Texas in Paris” is an uplifting show with dazzling performances by two actors with considerable talents. The entire production is a joy to experience. This review appeared in the Arts/Culture section of the online magazine “LitroNY” in February 2015.